Professional-C serum with Vitamin C neutralizes free radicals at all layers of the skin, before they damage skin cells and accelerate aging. The serum provides superior antioxidant protection with deep penetration. Add supple youthfulness to your skin with this 20 percent strength serum. Suitable for all skin types, Professional-C serum comes in a convenient single-ounce size. Toss it in your purse or travel bag, and use it daily for radiant results. The Obagi System brand offers superior luxurious skincare and is proudly made in the USA. 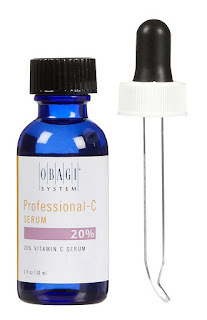 Apply 5 to 7 drops of Obagi Professional-C Serum to the face, neck and chest using fingertips. Apply to cleansed skin in the morning before sunscreen and makeup application. A slight tingling may occur in some people, which diminishes with continued use. Store at room temperature 15°-30°C (59°-86°F). Keep out of direct sunlight.